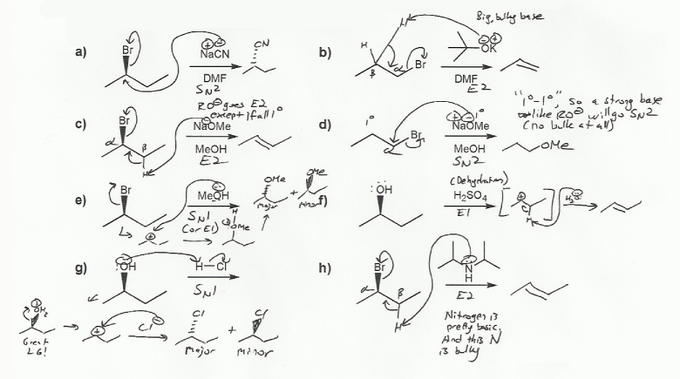 For each reaction below, determine whether the primary reaction is SN1, SN2, E1, or E2, and then draw the product. 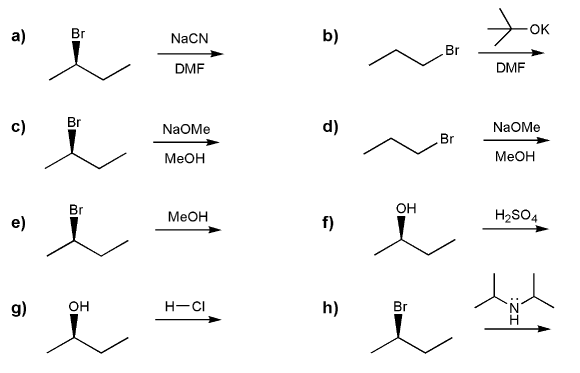 neutral or acidic conditions tend to go SN1 or E1 (carbocation is formed). If you see heat (or Δ), the reaction will go elimination. If you see a big, bulky compound, the reaction will go elmination. If you see a strong base, the reaction will go elimination. Strong base is anything stronger than RO-. The exception: if everything is primary, it will probably go SN2. These rules probably seem confusing, so let's go through these eight examples and see how they apply. a) NaCN is charged! (Na+ and CN-), so it's SN2 or E2. CN is not a strong base, so it's SN2. b) KOtBu (potassium tert-butoxide) is charged, so it's SN2 or E2. -OtBu is a strong base, so if anything is more bulky than 1º it will go E2. -OtBu is 3º, so it will definitely go E2 (KOtBu is a classic E2 reagent). c) NaOMe is charged so E2 or SN2. NaOMe is a strong base, so if anything >1º it will go E2. -OMe is 1º (actually, not even 1º), but the alkyl halide is 2º, so it will go E2. d) NaOMe is charged so E2 or SN2. NaOMe is a strong base, so if anything >1º it will go E2. But in this case there is no bulk whatsoever- nothing is >1º! NaOMe is 1 and the alkyl halide is also 1º, so it will go SN2. e) Methanol (MeOH) is neutral so probably E1 or SN1. Methanol is a weak base and there's no bulk, so SN1. In general water and alcohol do a mixture of SN1 and E1 with alkyl halides (mostly SN1). f) H2SO4 is acidic so probably E1 or SN1. Can't be SN1 though because there is no nucleophile in H2SO4. (HSO4- is a very weak nucleophile). An alcohol with H2SO4 or H3PO4 is a dehydration reaction- E1. g) H2SO4 is acidic so probably E1 or SN1. In this case we have a nucleophile- Cl-, so it will go SN1. h) Amines are neutral but they don't so SN1/E1- they tend to go SN2/E2, because they are basic (an amine solution has a basic pH). This amine is really bulky so it will go E2. MendelSet practice problem # 560 submitted by Matt on July 7, 2011.